How big of a deal is this? H tires are rated for 130 mph while T's are 118 mph. This car isn't going to see any speeds remotely close to those. I read H tires have better cornering performance but I think that's more important for a sports car, not a 16 yr old beater. The H's also have a shorter warranty -- 65 vs 75k. Another issue is the alignment I had done. As a note, only toe is adjustable on this car (camber requires special aftermarket bolts). The back right tire's camber actually went OUT of spec after the alignment. I talked to the tech and he said sometimes when fixing the toe, the camber can get out of wack. He said he had to bring the toe into spec as to not prematurely wear the tire and slightly off camber isn't a big deal. Does this make sense to you guys? Last edited by mclasser; 01/12/18 04:15 PM. Is there a price difference between the two ratings? What you got should be fine but the shop should credit you. Check your invoice / receipt carefully. I�ll let a alignment expert answer the other part. Well, as far as the tire go, the RT43 "T" speed rating score slightly higher than their "H" speed rated brother on both The Tire Rack & Consumer Reports and have slightly longer tread life to boot..IIRC! Did you pay more for the "H" compared to the "T" rated tires? Is this optimal?...Well, I often get "T" over the "H" when I can. Should you turn back and get the proper speed rating or a refund? ...it's up to you! I've had the RT43 in a "T" speed rating on a Lexus and loved'em! As far as the alignment, others will have to chime in on that one. Last edited by Char Baby; 01/12/18 04:33 PM. Never let a tire shop align your car. I would bring the spec difference up and see what they say. Unlikely you'd ever see 118 anyway, but you ordered H, so you should get H ones or be made whole otherwise. I think your alignment is fine but I'm not an expert by any means. Not a big deal. If I were in your shoes, I would go for the higher mileage warranty if it's truly for a beater. I wouldn't want to have to dump more money in to new tires earlier than necessary on it. They had the Ts in stock and wanted to make a sale. This often overrides anything else. If they said they could get you some H's tomorrow you might go to another dealer in the meantime. As for the camber they could have ground out a strut hole a little but were too lazy. "Toe and go". That said if it drives fine, leave it. Your cross camber kinda cancels it out. As for the speed rating if you feel fine, I feel fine. If the car handles and rides OK, why mess with success? Just do my tires, so I can go. 4 tires mtd on new wheels etc. 1 3/4 hrs. Car drives fine, just like it did before. However, the lower speed rating is probably not that important for your car and intended usage. Both versions of the RT43 are popular on here, and you will probably have no problems with them. over the years, they have always been a tire with a speed rating of less than H.
My alignment philosophy has evolved over the years. When starting with a new car, if it tracks straight and the tires wear relatively evenly I don't touch alignment when replacing tires. This might sound wacky, but I feel like once you loosen bolts to adjust the alignment it never holds like new again. If I have to replace any steering related components I consider alignment. I'm talking about tie rod ends or control arms. 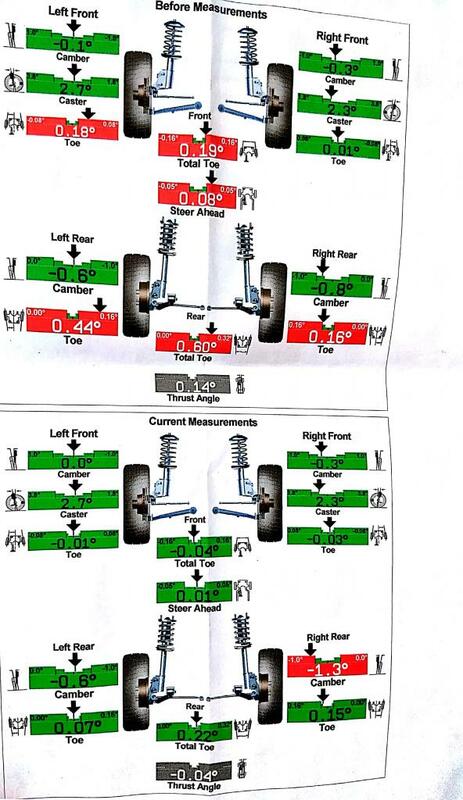 I would not get an alignment if replacing struts, ball joints, wheel bearings, or anti-roll bar bushings. The caveat there is that the car must still track straight and the tires should not be wearing unevenly.